Other Names = Bharatpur in Rajasthan is also called the gateway or tube-door. Rath moved resolutions – Alwar and Bharatpur districts of Haryana border region seems to say it Rath moved resolutions. Alwar, Bharatpur and Dholpur districts of the states of Rajasthan and Uttar Pradesh on the basis of similarity in the linguistic integration time wanted to meet. 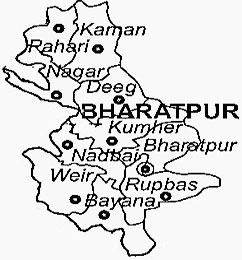 Bharatpur is bordered by the states bordering Haryana and Uttar Pradesh. Antrajyiy the smallest division in the border area. Canal Bharatpur – Bharatpur in Rajasthan and Madhya Pradesh states in 1960 was the beginning of the canal as it was completed in 1964. The canal has benefited enormously from the Bharatpur district. Ruparal (Warah / Lswari) – This river originates from Thanagaji in Alwar district, in Bharatpur ends. Baratha Ajan Dam and the dam is located in the Bharatpur district. Moti Lake – This lake is located in the city of Bharatpur. The use of this water is used for irrigation. Keoladeo dense – The National Park is also known by the name of Bharatpur National Park. In 1982 it was declared a national park and UNESCO World Natural Heritage List in 1985. It involved. 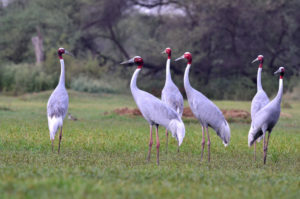 Each year to spend the winter in the warmer climate of Bharatpur revolutionized the rare Siberian cranes come here. Lohagdh fort – This fort was built by Maharaja Suraj Mal Jat build the fortification it is famous for its impregnability. Jawahar Burj and the citadel is located, was built to commemorate the victory of Maharaja Jwahrsinh Delhi. Deeg Fort – This fort was built in 1730 by Bdnsinh. Earnest Fort – the fort due to the high mountain fortress Durbedyta the king and the legend, also known by the name of Vijaygdh Sonitpur in earnest, Banpur, Sripur, etc. Sripnth stated. And earnest fortification built by the sea in the secret of the victory column which is Rajasthan’s first victory column. Lakshmana Temple – Lakshmana temple was built in 1870 Jat Maharaja Balwant Singh. Jlmahl of Deeg – Bharatpur Deeg is called the city of Jlmahlon. Jlmahl made between the two ponds, which were built by Maharaja Suraj Mal. LAL Maid Creed – Nagla ship its principal seat is located in Bharatpur. Its founder Lal Das Ji. Devbaba ji- His birth took place in Bharatpur ship Nagla Badr Shukla Panchami, the festival fills them. And the Gujjar caste is considered a deity. Hara -gwalon follow the nickname. Notnki – it’s well-known folk theater in Bharatpur. Brij Festival in Bharatpur district is created in February. Jaswant cattle fair is = Celebrated in the Bharatpur district. Epicure song – It Brij (Bharatpur) and Dholpur areas processional song. Saver – Saver Here Bharatpur Central mustard research center was founded in 1993. Rajasthan’s Bharatpur district in Rajasthan in the first place is the production of mustard. Simgon wagon factory. It is located in Bharatpur district, a manufacturer of railway rolling stock, which closed on November 13, 2000 has been. The Sansi tribe lives in Bharatpur district. Rajasthan is one of the 4 cooperative animal feed center Nadbai (Ngbi) is located in Bharatpur district.